Summary: There’s never a dull day in Henry Adams, Kansas. Tamar July has never had a great relationship with certain members of her family. In fact, she’d characterize it as a “hate/hate relationship.” But when her cousin calls her with the news that she’s dying and wants Tamar to plan the funeral, she’s shocked but is willing to drop everything for her. After a horrendous storm, Gemma finds a young boy and his little sister walking on the side of the road. She takes them in, and quickly falls in love with the orphaned siblings. But when Gemma contacts Social Services to try to become their foster mother, she’s told a white woman cannot foster African-American children. In the midst of these trials, Jack and Rocky are trying to plan their wedding. The entire town comes together to lend a helping hand. Though the residents of Henry Adams face seemingly insurmountable obstacles, each of them will discover that family comes in many forms, especially during the most trying of times. Review: A recent Instagram challenge prompted the question, what books would you like to see become a series. 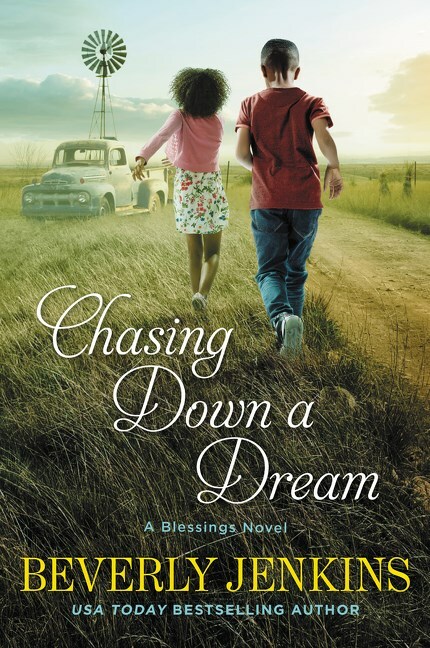 Immediately the Blessing series came to mind because I love the characters and I love the small town feel of Henry Adams. Beverly Jenkins has created a town that the Hallmark channel would be proud of. For the life of me, I can't understand why they haven't jumped at a chance to bring Henry Adams to life. I tune in to The Good Witch regularly for the small town living vibe that Middleton has. And I loved the unique characters found in The Gilmore Girls' Star's Hollow. If I could pack my bags and head for Henry Adams, I would, but I'd settle for just seeing this lively bunch on TV weekly. But I digress. Jenkins' strength lies in the fact that she creates so many rich characters in her stories that any of them can take the lead and hold a story line of their own at any point. 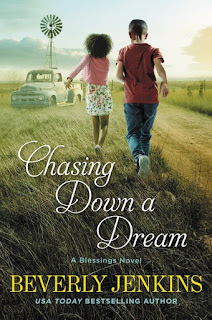 In her latest, Chasing Down a Dream, we see Gemma, a character with a lesser role in previous books, take the lead as she deals with workplace issues, pursuing college at a seasoned age, and fostering two children, in addition to raising her grandson. She has a lot going on, right? The author doesn't sugarcoat how difficult of a time Gemma is having adapting to her life, but she does give her a great support system. The illness of a member of the July clan brings Tamar's hell raising, motorcycle riding family to town, which is predictably an adventure. It's always great to see them because they tend to bring history right along with them. And they get Tamar's hackles up, which is quite entertaining. Some of the children we met in Bring on the Blessings and subsequent books are starting to grow up and move on. It's bittersweet to see this. As a reader, I'm happy to see these kids overcome obstacles and become thriving adults, but what if they decide to leave Henry Adams? Will Jenkins bring them back? Will she follow them on their new adventures? Can you tell how much I love Henry Adams and the Blessings' series? I can't wait to see what's next for this small town's residents.